By Keith Cowing on July 31, 2011 11:37 PM. "This roadmap is broadly inclusive in capturing the multitude of U.S. national security, civil, and industry-commercial interests in space transportation that exist today. Still, it is useful to discuss its national security military origins. Roadmap development was most recently sparked by a validated military need for space transportation, namely the Marine Corps Small Unit Space Transport and Insertion (SUSTAIN) capability. Although SUSTAIN represents a mere niche within the full range of potential space transportation applications, the idea harkens back to the birth of the American space program. Reciting the vision of DoD leaders with respect to the exceptional potential of space transportation, even during an earlier age of immature space- related capabilities is useful. It serves as a testament to both the inexorable inevitability of space transportation and our specific National interest in maintaining leadership in developing the enabling technologies." By Keith Cowing on July 29, 2011 5:01 PM. "As you know, Congress is debating how it plans to meet its obligations and raise the debt ceiling so that the country can pay its bills. The President expects that Congress will do its job, enact an increase of the debt ceiling that he can sign into law, and end this impasse. I am sending this note to remind you that NASA employees should plan to come to work next week, as scheduled, at their normal place and time." By Keith Cowing on July 29, 2011 3:59 PM. "It is with great sadness that I note the passing of Dr. John H. Marburger, III, former Director of the White House Office of Science and Technology Policy and Science Advisor to President George W. Bush. Jack Marburger leaves a legacy of exceptional public service and substantial scientific contributions. He was the Nation's longest-serving Presidential Science Advisor, and his focus on basic research as a driver of economic growth was a common thread across Congresses and Administrations." By Keith Cowing on July 29, 2011 11:34 AM. "NASA satellite data from the years 2000 through 2011 show the Earth's atmosphere is allowing far more heat to be released into space than alarmist computer models have predicted, reports a new study in the peer-reviewed science journal Remote Sensing. The study indicates far less future global warming will occur than United Nations computer models have predicted, and supports prior studies indicating increases in atmospheric carbon dioxide trap far less heat than alarmists have claimed." "Joe Bast and his libertarian think tank are a major force among climate sceptics -- but they just can't win the battle over science." By Keith Cowing on July 28, 2011 11:49 AM. Keith's note: The NewSpace 2011 conference is underway at NASA ARC. You can follow updates via Twitter here. By Keith Cowing on July 28, 2011 12:05 AM. "The Energy Department and the Department of the Interior are among dozens of federal agencies looking to hire some of the engineers and scientists from NASA's closing space program. NASA and the Office of Personnel Management held a job fair yesterday in Cape Canaveral, Fla., less than a week after the space shuttle Atlantis landed. All told, about 5,500 contract employees at Florida's Kennedy Space Center have lost their jobs in recent months, and NASA contractors are expected to lay off another 2,000 over the next year. For an area nicknamed the "Space Coast," the end of the space program is a blow. But federal agencies are swooping in to take advantage of a pool of employees they say have skills that are usually hard to find." By Keith Cowing on July 27, 2011 8:51 PM. "Russia's space agency announced Wednesday that the International Space Station -- a space base the world's scientists and billions of U.S. tax dollars helped build and maintain some 200 miles above the surface of the Earth -- will be de-orbited and allowed to sink into the Pacific Ocean in 2020, just like its Russian predecessor, Mir. "We will be forced to sink the ISS. We cannot leave it in orbit as it is a very complicated and a heavy object," Roscosmos' deputy head Vitaly Davydov said in an interview posted on the agency's website." "The Multilateral Coordination Board (MCB) for the International Space Station partner agencies met Tuesday, July 26, to discuss how to use the space station as a test bed for technologies that will enable missions beyond low Earth orbit." Keith's note: So, I guess that's it then. Russia gets to make the decision to scrap something we paid the lion's share to build and operate - after paying to keep Russia's space program aloft for a decade prior to that. Who makes all of these "deals" for the U.S. anyway? We seem to be getting the short end of the stick each and every time. Why have these MCB meetings about other uses for the ISS when Russia simply plans to scrap it anyway? "The interview from "Good Morning Russia" ("Utro Rossii") caused a stir when a Russian-language transcript turned up on the space agency's website, but don't panic: If anything, the International Space Station will be in operation well after 2020. Russia, NASA and the other partners in the 16-nation venture are looking into extending the station's lifetime to 2028 -- that is, if they can verify that its components will still be in working order until then." By Keith Cowing on July 27, 2011 12:22 PM. "With the retirement of the Space Shuttle Atlantis last week, American astronauts are now totally dependent on Russian vehicles for access to space. The question in front of us is how best to negotiate for fair compromises in the US-Russian space alliance. Some of NASA's recent agreements are not encouraging. The US needs to realize that it holds some high cards. True, the Russians have, in the Soyuz, the only vehicle that can carry passengers. But the destination - the International Space Station, which is more than 80 percent funded by the U.S. - provides many critical space services without which getting into orbit is pretty pointless for the Russians. Chief among them is electrical power and space-to-Earth communications, most of which comes via American equipment." By Keith Cowing on July 27, 2011 12:14 AM. "To date, agencies have closed 81 data centers and will close 114 more during this calendar year for a total of 195 in 2011.This represents an increase in both planned and actual closures from the data released in April 2011. As agencies have continued to update their data center inventories, they have increased their planned closures, demonstrating the seriousness in which they are attacking waste." By Keith Cowing on July 26, 2011 1:45 PM. Keith's note: Word has it that Jon Morse, Astrophysics Division Director at SMD also announced his resignation today. FYI John Morse is married to Laurie Leshin so a joint departure/move by both of them sort of makes sense. "Jon Morse, director of the Science Mission Directorate's Astrophysics Division and Laurie's husband, also will be leaving government to join RPI as the associate vice president for research." By Keith Cowing on July 26, 2011 1:33 PM. "I told my staff this morning that I plan to retire effective 31 August. From June, 2002, when Sean O'Keefe asked me to return to NASA for a third time to serve in this position, until this very day, I have been privileged to work on important projects with and among the best people in the world. Over time you have celebrated great successes and suffered and learned from horrific failures with determination, skill and a world beating attitude, and by so doing have kept me in a continuous state of awe." By Keith Cowing on July 26, 2011 1:09 PM. "I wanted to share some news with you. I have accepted a position outside of NASA. I will be the Dean of the School of Science at Rensselaer Polytechnic Institute (RPI) in New York starting in October. RPI will be announcing my appointment today. I will remain here at NASA HQ until mid- to late-September and look forward to continuing to work with all of you on the creation of HEOMD. I will continue as Deputy AA in ESMD until the HEOMD unification takes place and will continue to work to stand up the two Divisions I was named acting Director of (AES AND SLPSRA) in HEO." Establishing a "JSC Acceleration Center"
By Keith Cowing on July 25, 2011 2:28 PM. "The National Aeronautics and Space Administration (NASA) Johnson Space Center (JSC) is seeking to identify potential industry interest in an agency real property asset located at JSC in Houston, TX for the purpose of establishing a "JSC Acceleration Center". This announcement describes a NASA asset that is currently underutilized as a result of the transition from the Space Shuttle Program (SSP) to the future mission activities authorized by Congress in the NASA Authorization Act of 2010." By Keith Cowing on July 25, 2011 1:12 PM. "The unification of standards is the first problem to solve in the effort to carry out future space station cooperation, Yang said, according to China's Xinhua news agency. "This is the first time I am aware of that any high-profile official associated with the Chinese space program has made such a strong statement to the Chinese public on ISS participation," Gregory Kulacki, a senior analyst and China Project Manager for the Union of Concerned Scientists' Global Security Program in Cambridge, Mass., told SPACE.com. "And, as far as I know, it is the first time I have heard a Chinese official confirm that the docking hardware they will be using in the upcoming mission is not compatible with the ISS." What Name Would You Pick for Pluto's Newly-Discovered Moon? By Keith Cowing on July 24, 2011 10:01 AM. "The new moon is the smallest discovered around Pluto. It has an estimated diameter of 8 to 21 miles (13 to 34 km). By comparison, Charon, Pluto's largest moon, is 648 miles (1,043 km) across, and the other moons, Nix and Hydra, are in the range of 20 to 70 miles in diameter (32 to 113 km)." Keith's note: If you had a chance to name this new moon what would you name it - and why did you pick that name? Oh yea, the IAU claims to have a monopoly on naming objects and features in our solar system - and beyond. But there is nothing legally binding to the names they decide to use. Everyone just goes along with them because ... well ... because. And who gave them this role anyways? Answer: they appoint themselves. So why can't the rest of us have a say in naming the things in our universe? The IAU is so 20th century. Its time to change this process. "It's called P4 for the time being," said Trent Perrotto, public affairs officer at NASA headquarters. "It'll get a name, but it's not up to NASA to decide on it." As usual with newly discovered astronomical objects, he explained, P4's name will be subject to a tough selection process overseen by an organization called the International Astronomical Union." Keith's note: Hmmm... then why do the Mars rover people name all the surface features that they encounter along the way? Why bother if IAU is just going to ignore the names and change them? Why not let the actual discoverers - and the people who pay for these missions - have a chance to name things - and not some self-appointed group whihc answers only to itself? "At the moment, there are only a handful of asteroid options and they all have names like 1999AO10 or 2009OS5. NASA deputy exploration chief Laurie Leshin figures NASA will have to come up with, not just more targets, but better names." By Keith Cowing on July 23, 2011 11:13 PM. "However, last year President Barack Obama shifted NASA policy away from human spaceflight. His budget cancelled the next-generation Constellation human flight system rather than modifying any deficiencies -- wasting a $9 billion taxpayer investment. Instead, NASA was directed to pursue a riskier course, diverting billions of dollars to a group of companies - most devoid of experience in manned space vehicles - to take over operations to low-earth orbit and the transport of astronauts to the International Space Station. The goal was to generate a private marketplace to support the cost of these manned missions." "This chapter is by no means the end of human space flight; it is the beginning of the next generation of scientists, engineers and unforeseen discoveries. I am dedicated to ensuring that Congress gives NASA the goal and resources to usher in the next generation of human space flight." Keith's note: Hmm, let's see, extended life for the human-occupied ISS, spurring development of multiple spacecraft (government and commercial) to carry humans into orbit, and plans for human missions to an asteroid and to Mars. If anything, the policy in place looks to expand the reach of humans beyond low Earth orbit. But the authors are not interested in facts - rather, they are interested only in partisan rhetoric. Indeed, Olson is not even consistent. In his official post-shuttle landing statement he says that this is "by no means the end of human space flight" and that exciting things lie ahead. A day later, in Politico, he (and Cunningham) put forth a contradictory claim that the Obama Adminstration has "shifted NASA policy away from human spaceflight." By Keith Cowing on July 22, 2011 3:28 PM. "Unfortunately, with the final landing of the Shuttle Atlantis and no indication of plans for future missions, this administration has set a significantly different milestone by shutting down our nation's legacy of leadership in human spaceflight and exploration, leaving American astronauts with no alternative but to hitchhike into space." "... Perry went on to say that, "this administration has set a significantly different milestone by shutting down our nation's legacy of leadership in human spaceflight and exploration, leaving American astronauts with no alternative but to hitchhike into space." Actually, it was the Bush Administration that decided to end shuttle missions, and the Obama Administration extended the life of the shuttle program by adding two additional flights." "The Shuttle's chief purpose over the next several years will be to help finish assembly of the International Space Station. In 2010, the Space Shuttle -- after nearly 30 years of duty -- will be retired from service." By Keith Cowing on July 22, 2011 12:38 PM. "Quality is key to success in U.S. space and missile defense programs, but quality problems exist that have endangered entire missions along with less-visible problems leading to unnecessary repair, scrap, rework, and stoppage; long delays; and millions in cost growth. For space and missile defense acquisitions, GAO was asked to examine quality problems related to parts and manufacturing processes and materials across DOD and NASA. DOD and NASA should implement a mechanism for periodic assessment of the condition of parts quality problems in major space and missile defense programs with periodic reporting to Congress. DOD partially agreed with the recommendation and NASA agreed. DOD agreed to annually address all quality issues, to include parts quality." By Keith Cowing on July 22, 2011 10:21 AM. "As you know, federal spending is under intense scrutiny. In addition, the timing of the federal budget review and approval process has been less than ideal. These developments have affected our ability to manage Astrobiology Program funds as effectively as we would like. Over the past decade, the proposal due date for the Exobiology Program has moved from June to August, then to September, and, finally, to October. This shift has moved starting dates for new grants later into the federal fiscal year and thus placed greater budget pressure on the Astrobiology Program." By Keith Cowing on July 21, 2011 11:11 PM. "Mankind acknowledges the role of American space ships in exploring the cosmos," it added. But Roskosmos also used the occasion to tout the virtues of the Soyuz (Union) spacecraft, which unlike the shuttle lands on Earth vertically with the aid of parachutes after leaving orbit. It said that there was a simple answer to why the Soyuz was still flying after the shuttles retired -- "reliability and not to mention cost efficiency." Keith's note: How nice of our friends at Roskosmos to rub our noses in their monopoly today. Oh well, we created this situation through both deliberate intent and bumbling over the past decade. Well played, comrades. Enjoy it while it lasts. By overcharging in the obscene, escalating fashion that you have done during our periods of need, you are sowing the seeds of your own demise by spurring lower cost alternatives. All too soon, American spacecraft will do everything Soyuz does - and more - and will do so much better - and cheaper. Keith's update: Yea, in case you had not noticed, I am really pi**ed off by this whole situation and how the Russians (whose space program we overtly subsidized since the 1990s) are dancing in response to our bad decisions and crappy predicament. Oh well, it will be fun to watch Russia wiggle as China flies the real Soyuz upgrades - and then as SpaceX et al beat Russia and China on both price and performance. By Keith Cowing on July 21, 2011 8:32 PM. "In addition, under the Commercial Crew Program, ULA is proud to be the launch vehicle of choice for Sierra Nevada's Dream Chaser and Blue Origin's Space Vehicle, and compete to support Boeing's CST-100 program. Working together with NASA, these established companies and entrepreneurs plan to usher in a bold new era of human spaceflight; not only transporting NASA astronauts to the International Space Station, but opening spaceflight to non-government passengers for the first time." "NASA's 30-year Space Shuttle Program has been more than just space exploration to Florida families, it's part of their history, it's their livelihoods, and it's been a source of inspiration for the tens of thousands of people who have supported its operations and have made their homes in our great state." By Keith Cowing on July 21, 2011 10:00 AM. "This unprecedented view of the space shuttle Atlantis, appearing like a bean sprout against clouds and city lights, on its way home, was photographed by the Expedition 28 crew of the International Space Station. Airglow over Earth can be seen in the background." By Marc Boucher on July 21, 2011 6:15 AM. "At 5:57:54 a.m EDT the orbiter Atlantis came to a wheels stop at the Kennedy Space Center runway 15 marking the end of the Space Shuttle era." "At today's final landing of the space shuttle, we had the rare opportunity to witness history. We turned the page on a remarkable era and began the next chapter in our nation's extraordinary story of exploration." "The brave astronauts of STS-135 are emblematic of the shuttle program -- skilled professionals from diverse backgrounds who propelled America to continued leadership in space with the shuttle's many successes," NASA Administrator Charles Bolden said. "This final shuttle flight marks the end of an era, but today, we recommit ourselves to continuing human spaceflight and taking the necessary- and difficult - steps to ensure America's leadership in human spaceflight for years to come." "Mission accomplished! It's been thirty great years for the Space Shuttle program. With this venerable space vehicle retired, it's on to the next adventure. "The Space Shuttle has taken more than 10,400 tons into orbit, a fantastic legacy, as most of that equipment is still up there helping astronauts do their jobs. But now it's time to move up and on -- outward. We can make new discoveries peering beyond new horizons." Continue reading Shuttle Era Ends. By Keith Cowing on July 20, 2011 9:06 PM. "Rep. Wolf and Rep. Fattah are highly likely to work out a deal to restore JWST funding before the bill goes to the House floor, perhaps involving enhanced language spelling out detailed project oversight requirements. The AAS is pursuing a strategy to directly encourage a solution in the House during floor debate by working with key individual legislators and to secure support from the Senate to restore funding in the Senate version of the FY2012 appropriations." By Keith Cowing on July 20, 2011 7:24 PM. "* The Bush Administration in 2004 made the decision to end the Space Shuttle program. President Obama extended the program's life by adding two Space Shuttle launches to the manifest: STS-134, which was funded in the President's FY 2010 Budget Request; and STS-135 which was funded as part of the agreement that the President reached with Congress for FY 2011 funding. * An independent commission found that the previous Administration's plan for human spaceflight in the post-Shuttle era was not viable under any feasible budget scenario. Among other challenges, it would have left NASA without the ability to get to the International Space Station until after it was de-orbited in 2016, and weakened other important NASA priorities including science, aeronautics, and technology development." By Keith Cowing on July 20, 2011 11:51 AM. "The number one long-term issue facing our country's leaders is economic growth, including job creation, GDP growth and increasing the balance of trade. Without a growing economy that creates new high wage jobs, our future is grim. For the private sector to help steward this growth, it needs sustainable, reliable federal budgets and investments by the government in technology innovation across the board, including aerospace. We applaud the House Appropriations Committee for the pace at which it is moving forward with the appropriations bills to fund the fiscal year that begins on October 1. We understand the need to reduce the deficit. But we must not jeopardize our future by dramatic cuts to the central core of our nation's economic development - investments in science and technology, particularly those associated with the space program." By Keith Cowing on July 19, 2011 2:19 PM. "... the National Aeronautics and Space Administration (NASA) and the National Oceanic and Atmospheric Administration (NOAA) together with the intelligence community, conduct a significant amount of space S&T. Although NASA and NOAA participation is not required, DOD may have missed an opportunity to leverage these agencies' activities and optimize its own S&T spending by involving them in strategy development. GAO was also required to evaluate the effectiveness of the coordination mechanisms planned to implement the strategy." By Keith Cowing on July 18, 2011 8:16 PM. "At this point I'm in agreement with Dr. Kraft ... In a world of limited budgets, I was willing to retire the shuttle as the price of getting a follow-on system that could allow us to establish a manned lunar base. Not that my opinion matters, but I see no sense in retiring the shuttle in favor of nothing. That is beyond foolish." It's a pretty stunning reversal from the man who, just a few years ago, couldn't get rid of the shuttle soon enough." Keith's note: Mike Griffin and his self-described "band of brothers" often referred to the Space Shuttle as an "albatross" and was indeed in a big hurry for it to go away. He seemed to have little worry that the "gap" that he so despised grew rather healthily under his tenure. Now that his self-described "Apollo on Steroids" architecture collapsed under its own flawed engineering and program execution, he's suddenly a space shuttle advocate. That's the problem with steroids, Mike: they affect both your memory and your judgement. By Keith Cowing on July 18, 2011 3:51 PM. "NASA and the Smithsonian's National Air and Space Museum will host a news conference at 10 a.m. EDT, Friday, July 22 to announce the selected landing site for the agency's latest Mars rover. The event will be in the museum's Moving Beyond Earth Gallery. NASA Television and the agency's Web site will provide live coverage of the event." Keith's note: As one rather prominent space/science to journalist just noted to me: "And in service to the media, there's no accessibility for off-site reporters. Brilliant!" By Keith Cowing on July 18, 2011 3:42 PM. "NASA's Dawn spacecraft on Saturday became the first probe ever to enter orbit around an object in the main asteroid belt between Mars and Jupiter." Keith's note: The last image to be publicly released was taken on 9 July - more than a week ago. Yet Cassini, Opportunity, and other missions send back dozens of new images every day - images that are quickly posted online for all to see. What is going on here? Why is NASA refusing to release Dawn imagery? Keith's update: I spoke (a little) too soon. That said, the Dawn folks have been exceptionally stingy when it comes to releasing images. "NASA's Dawn spacecraft has returned the first close-up image after beginning its orbit around the giant asteroid Vesta. On Friday, July 15, Dawn became the first probe to enter orbit around an object in the main asteroid belt between Mars and Jupiter." By Keith Cowing on July 18, 2011 3:37 PM. "NASA and ULA's unfunded Space Act Agreement (SAA) requires ULA to provide data on the Atlas V, a flight-proven expendable launch vehicle used by NASA and the Department of Defense for critical space missions. NASA will share its human spaceflight experience with ULA to advance crew transportation system capabilities and the draft human certification requirements. ULA will provide NASA feedback about those requirements, including providing input on the technical feasibility and cost effectiveness of NASA's proposed certification approach." Ed Weiler Thinks Obama's JWST Budget = "Road to Nowhere"
By Keith Cowing on July 18, 2011 10:56 AM. "Ed Weiler, NASA's associate administrator for science, called the Obama administration's flat budget for JWST a "road to nowhere." "You'll get to launch, but our grandchildren will have to use it," Weiler said." Keith's note: It is not uncommon in situations such as this where a senior federal agency official publicy breaks with (and openly insults) Administration policy to announce that they are departing the agency to "spend more time with their family. etc." Stay tuned. By Keith Cowing on July 18, 2011 10:38 AM. "In my opinion, NASA's SLS program is stalled because the White House doesn't really want to do it," former NASA Administrator Michael Griffin said Friday. Griffin, who led NASA during the previous rocket program that Obama killed, has been a persistent critic of NASA's current direction. Griffin is now an eminent scholar at the University of Alabama in Huntsville. "You will recall that SLS is derogatorily referenced by some as the 'Senate Launch System,'" Griffin said in an email response to questions. "That is because the Congress forced it upon the executive branch. The fact that it is the right thing for NASA to do is irrelevant; the White House doesn't want to do it, and they will do everything possible to prevent it from occurring." By Keith Cowing on July 15, 2011 3:08 PM. "There are 14 pages of text pertaining to NASA in the committee report accompanying the FY 2012 Commerce, Justice, Science Appropriations Bill that was passed by the House on July 13. In often great detail House appropriators spell out their recommendations for how the $16,810,257,000 provided to NASA should be spent in FY 2012. Selections from this language, which starts on page 68 of the committee report follow. All figures are taken from the committee report." By Keith Cowing on July 15, 2011 2:13 PM. "The National Aeronautics and Space Administration (NASA) will present a status of the Commercial Crew Program strategy on Wednesday, July 20, 2011. The Forum will be held at the Press Site at Kennedy Space Center from 11:00 a.m. to 12:00 p.m. The Program Forum's key topics will include: Background of NASA's Commercial Crew Strategy, Key Program Attributes, Potential Commercial Crew Program Strategy, Short Q&A session." Keith's note: 5 day's advanced notice - over a weekend. Too bad NASA hasn't a clue how to plan these things - they had more than a thousand media at KSC just last week and more showing up fo rthe landing. A simple handout could have enhanced visibility for this program immensely. Its hard to play "capture the flag" when you don't let people know where the flag is ... at least they are webcasting it. By Keith Cowing on July 15, 2011 2:03 PM. "President Obama: Well, this mission marks the final flight of the Space Shuttle Program and also ushers in an exciting new era, to push the frontiers of space exploration and human spaceflight. You guys will continue to operate, or crew members like you will continue to operate the ISS in coming years, and seek to use it to advance scientific research and technology development. I've tasked NASA with an ambitious new mission to develop the systems and space technologies that are going to be necessary to conduct exploration beyond Earth, and ultimately sending humans to Mars, which is obviously no small feat, but I know we're going to be up to the task." By Keith Cowing on July 15, 2011 1:40 PM. Keith's note: On Friday President Obama will call the crews of the Space Shuttle Atlantis and the International Space Station from the Oval Office starting at 12:29 pm EDT. Keith's update: During his call to the orbiting Space Shuttle Atlantis and International Space Station crews today, President Obama mentioned that a special American Flag had been carried to orbit on board Atlantis - a flag that had been carried aboard Columbia during STS-1. According to STS-135 Commander Chris Ferguson, this flag will be left on board the ISS until the next crew of Americans is launched from American soil aboard a commercial spacecraft. The President joked that this is going to become sort of a "capture the flag" game for the commercial spaceflight industry. Shortly thereafter SpaceX tweeted "SpaceX commencing flag capturing sequence..."
By Keith Cowing on July 15, 2011 11:25 AM. "The 10 crew members aboard space shuttle Atlantis and the International Space Station will hold a news conference at 8:24 a.m. CDT on Friday, July 15. NASA Television will provide live coverage of the 40-minute news conference." "If there is one thing I'd say [to policymakers] it is that we need to focus our efforts. I'd appeal to Congress to focus on the long term. They need to look at the horizon - look out 10 years and see where they want the nation to be. We need a coherent space policy that will take us 10 to 15 years out - a decadal plan - and then make it a law so that we have to follow it so that Congress and future administrations are obliged to follow the policy that we, as a nation, have set forth." By Keith Cowing on July 15, 2011 7:27 AM. "Rick Howard, NASA's JWST program director, said the agency determined the observatory could launch on a European Ariane 5 rocket as soon as October 2018, but it would require fresh funding. And with the federal government focused on wrangling in debt, a budget increase for the troubled JWST project is unlikely. NASA officials were speaking to the agency's astrophysics advisory council, a board of senior researchers chartered to provide advice and input in major scientific and programmatic decisions. "To get to [launch] in 2018, it's going to take a significant amount of new funds," Howard said." By Keith Cowing on July 14, 2011 11:07 PM. "NASA's education and outreach activities are funded by NASA's Office of Education, Mission Directorates, and Offices of Chief Technologist and Communications. NASA's Education Coordinating Council includes representatives from each of NASA's field Centers plus the Jet Propulsion Laboratory (JPL), which deliver education and outreach. Data collection to be covered by this request are organized around three goals: (1) Contribute to the development of the Science, Technology, Engineering, Mathematics (STEM) workforce in disciplines needed to achieve NASA's strategic goals, through a portfolio of investments; (2) attract and retain students in STEM disciplines through a progression of educational opportunities for students, teachers, and faculty; and (3) build between STEM formal and informal education providers strategic partnerships and linkages that promote STEM literacy and awareness of NASA's missions." By Keith Cowing on July 14, 2011 5:37 PM. "A 17 year old EckAdams model number 5353 chair was submitted for failure analysis when the cylinder of the chair failed during use. Both macroscopic and microscopic indications of fatigue were observed on the cylinder fracture surface, indicating that the cylinder progressively failed due to the bending stresses imparted on the cylinder during a reclining motion. The stress on the cylinder was likely exacerbated by failed welds that were observed between the chair back mounting plate and the base plate, which ...."
Keith's note: Yes, NASA KSC actually did a full-blown failure analysis of an old piece of office furniture that broke. That's right - an old office chair broke (surprise) and the rocket scientists descended upon it as if it were a Mishap Investigation Board - like the kind that you set up after a rocket blows up. Included in this analysis were detailed SEM (Scanning Electron Microscope) and stereo microscopic imagery analysis. I would be willing to bet that the cost of this analysis certainly exceeded the cost of simply replacing the broken chair and that it vastly exceeded the actual value of the 17 year old chair itself. You hear people defending the way that NASA operates and then something like this shows up. You have to wonder if there is any common sense in the management manuals they use these days. I wonder if KSC PAO can dig up the actual cost of this CFA (Chair Failure Analysis). By Keith Cowing on July 14, 2011 3:42 PM. "The bill includes a provision that repeals existing prohibitions on the implementation of Reductions in Force or other involuntary separations." By Keith Cowing on July 14, 2011 3:34 PM. "The full House Appropriations Committee had been meeting for almost 3 1/2 hours yesterday when Rep. Adam Schiff (D-CA) rose to offer an amendment to provide $200 million for the James Webb Space Telescope in the FY 2012 Commerce, Justice, Science Appropriations Bill. A vote was pending on the House floor, and House Appropriations Committee Chairman Harold Rogers (R-KY) was ready to take a final vote to pass the bill. After brief comments by Schiff and Commerce, Justice, Science Appropriations Subcommittee Chairman Frank Wolf (R-VA) a voice vote was called, and the amendment was rejected. Schiff's amendment would have moved $200 million from NASA's Cross Agency Support budget, for which the bill allocated approximately $3 billion. This amendment was one of several that sought to transfer money from this budget category to other programs. All were rejected." By Keith Cowing on July 14, 2011 11:09 AM. According to someone@nasa.gov: "The LCS SE&I group celebrated the launch of STS-135 with homemade Italian bread and cold cuts!! Checkout this work of art!!" By Keith Cowing on July 14, 2011 11:05 AM. "On July 15, NASA's Dawn spacecraft will begin a prolonged encounter with the asteroid Vesta, making the mission the first to enter orbit around a main-belt asteroid. The main asteroid belt lies between the orbits of Mars and Jupiter. Dawn will study Vesta for one year, and observations will help scientists understand the earliest chapter of our solar system's history." By Keith Cowing on July 13, 2011 3:12 PM. "No one questions the need to ensure the best understanding of program costs. We do that every year on an ongoing basis with every major NASA program, as we set spending levels in our annual budget. There is simply no need to defer announcing the vehicle design decision while awaiting yet another cost review. "To do so only increases the real human cost that NASA employees and contractors are experiencing in the face of continued uncertainty about the future. Without a decision we will continue to lose skilled workers that we need to build the shuttle replacements. Besides the toll this will take on workers and their families, who have contributed so much to science, our national security, and the economy, it will be difficult and more costly to replace this invaluable human capital. "We have the information to make a decision now, and I call on the Administration and OMB to immediately make public and approve NASA's technical design decision on the heavy lift vehicle." By Keith Cowing on July 13, 2011 2:57 PM. "NASA has selected the Center for the Advancement of Science in Space Inc. (CASIS) to develop and manage the U.S. portion of the International Space Station that will be operated as a national laboratory. At the conclusion of successful negotiations, the independent, nonprofit research management organization will help ensure the station's unique capabilities are available to the broadest possible cross-section of the U.S. scientific, technological and industrial communities." Keith's note: NASA Assistant Associate Administrator for International Space Station Mark Uhran has been telling friends and co-workers that he will be leaving NASA on/by 1 October 2011. It will be interesting to see who replaces him. Betting odds are that it will be someone from JSC since they are not at all thrilled with this NGO concept to begin with - and carved significant portions of U.S. ISS research out from the purview of this new NGO. Moreover they need to make sure that KSC (or any other NASA center) does not exert undue influence. "A team that includes such premier aerospace and scientific talents as: Boeing Company, Bionetics, Dynamac Corporation, and the other members of the CASIS proposal, represent the necessary skills and expertise to assure success. When backed by the unique approach and capabilities of Space Florida, and the unmatched history of commitment by the State of Florida to NASA achievement, I can confidently stand behind this proposal." By Keith Cowing on July 12, 2011 9:39 PM. "We found that NASA's acquisition professionals generally do not monitor or track the potential termination liability costs of its contractors nor does the FAR require them to do so. The agency has not issued detailed instructions or provided guidance to direct contracting officers and others on how to monitor or track termination liability and to supplement the reliance on the relevant FAR provisions. As a result, resource analysts and financial managers inconsistently monitor and fund potential termination liability across the projects we reviewed." By Keith Cowing on July 12, 2011 10:34 AM. "The NASA budget structure has changed far too many times over the last several years. Regularly creating new accounts and shifting programs among accounts complicate efforts to make multiyear funding comparisons and obscure long-term funding trends. The bill adopts NASA's proposal to create a new account for Space Technology because this is the completion of a realignment that has been underway for some time. The Committee expects this to be the last such structural change for the foreseeable future." Today's Hearing: Where is the SLS Selection? By Keith Cowing on July 12, 2011 10:17 AM. "The original intent of the hearing was to examine NASA's selection of a heavy-lift launch system ("Space Launch System") that will be used to launch future crew and cargo flights beyond low Earth orbit. Members would have had an opportunity to ask questions regarding cost, schedule, capabilities, and justification for the selected design. However, on July 7, a senior NASA official publicly stated that a final decision on SLS won't be announced until "late this summer." In light of NASA's continuing delays (the NASA Authorization Act of 2010 required a decision and report by mid-January 2011), the hearing will instead provide an opportunity for NASA to explain why it has failed to reach a decision, what analyses still need to be completed, and when the Space Launch System decisions will be forthcoming." Keith's note: Rep. Hall opended the hearing by telling Bolden that not getting SLS documentation the committee had requested from NASA "is almost an insult to this committee and to Congress". Rep. Johnson said that Bolden can "expect to be on the receiving end of some frustration from members - including me." "As a preface to the formal portion of my statement, I want to first congratulate all the men and women at NASA and its contractors for the successful launch of STS-135. The Shuttle launch was viewed by tens of thousands on hand in Florida and millions more around the world, including a packed crowd in this hearing room, and it was a bittersweet moment to watch the last flight of the Shuttle Atlantis lift off from Kennedy Space Center." "Administrator Bolden, as you know, you have been called to testify on NASA's plans to develop the vehicles that will enable future human exploration beyond low-Earth orbit--vehicles that have been authorized and funded by Congress. However, as you also know--and will testify today--you still don't have an approved plan to share with us. As a result, I expect that you will be on the receiving end of a lot of unhappiness and irritation expressed by many Members here today. That's unfortunate, because the fault doesn't lie with you. It's my understanding that you have had a plan ready to announce for some time, but you haven't been able to get the final okay to make it public." "Today, the House Committee on Science, Space, and Technology held a hearing entitled, "A Review of NASA's Space Launch System." The purpose of the hearing was for the NASA Administrator to explain why the agency has failed to reach a decision on the architecture for the Space Launch System, what analyses still need to be completed, and when final acquisition decisions will be made." "NASA Administrator Charlie Bolden told Congress on Tuesday that it could be weeks -- or longer -- before the agency unveils the design for its next big rocket, a timeline that prompted lawmakers to threaten an investigation into the delay. "We have waited for answers that have not come. We have pleaded for answers that have not come," said U.S. Rep. Ralph Hall, the Texas Republican who chairs the House science committee. "We have run out of patience." "NASA maintained at various times that a decision was coming in the spring, then in June, then in early July. NASA associate administrator Lori Garver said last week the agency hopes to make an announcement by late summer." "I have requested an interview with Charlie Bolden, NASA's administrator, at least half a dozen times since Feb. 2010, the last time I had the opportunity to speak with him. Fact is, Bolden is been all but inaccessible to the media since an initial around of interviews after President Obama released his plan for human spaceflight in early 2010. His predecessors frequently attended pre- and post-launch shuttle news conferences. Bolden rarely if ever does. It's weird. It's not like he's not in Florida for the launches. He is. Anyway, to her credit, Sheila Jackson Lee got a few Houston-related questions in during a House science committee hearing on NASA's Space Launch System. She takes a lot of grief for being too interested in getting in front of cameras, but in this case I'm glad she did." By Keith Cowing on July 11, 2011 3:23 PM. "The crew's All American menu begins with crackers, brie cheese and sausage." Keith's note: Brie cheese? Wikipedia says: "Brie is a soft cow cheese named after Brie, the French region from which it originated (roughly corresponding to the modern dpartement of Seine-et-Marne)." Gee, that doesn't sound "all-American" to me. Duh - why not serve "American cheese"? Wikipedia says: "American cheese is used in American cuisine, for example on cheeseburgers, in grilled cheese sandwiches, and in macaroni and cheese". Yes, it is a slow news day. By Keith Cowing on July 11, 2011 11:56 AM. "To get a peek at how commercial space will prepare its people, I signed up for private astronaut training, a three-day NASTAR certificate course for suborbital researchers. Founded in 2006, NASTAR began as a showcase for its parent company, Environmental Tectonics Corp., a leading maker of flight simulators. In 2010 it won Federal Aviation Administration approval for private space training, the first company to do so. The course remains optional, but regulators may require it as part of a company's license. "We're basically leaving it up to the companies," says George Nield, associate administrator for the FAA's office of commercial space transportation." By Keith Cowing on July 11, 2011 10:07 AM. "The American Astronomical Society calls upon all members of Congress to support JWST to its completion and to provide strong oversight on the path to this goal. Too many taxpayer dollars have already been spent to cancel the mission now; its benefits far outweigh the remaining costs. We must see the mission through. We are a great nation and we do great things. JWST represents our highest aspirations and will be one of our most significant accomplishments." "In commenting on the proposed cancellation, Dr. William S. Smith, President of the Association of Universities for Research in Astronomy said "Against a backdrop of widespread discussion over the future of NASA and the human spaceflight program, it is tragic that the Congress is also proposing to curtail NASA's science program. JWST is NASA's premier science facility, unsurpassed by any other telescope now or in the future." By Keith Cowing on July 10, 2011 3:21 PM. This photo shows Space Shuttle Atlantis punching a hole in the sky on its way to orbit. The image was taken on 8 July 2011 from a high altitude balloon flown by students and volunteers at Quest For Stars. Larger image here. Additional photos from STS-135 and earlier shuttle missions can be found here. By Keith Cowing on July 10, 2011 11:02 AM. At a press conference at NASA KSC several days ago I asked the following question of NASA Deputy Administrator Lori Garver: "Yesterday you went on SpaceX tour [with the media] here at the Cape. We all heard talk of launching the Falcon 9 rocket with single digit number of people using launch and mission control rooms smaller than the one we are in today. And they want to do it with even fewer people. And they have competitors. NASA is about to embark on development of SLS, Orion, missions to asteroids, and the continued operation of the ISS. Will NASA ever approach the levels of innovation and efficiency as are evidenced by SpaceX and other companies? If so, when? If not, why not? I guess the real question I have is, its the 21st century. Indeed we have already used up 10% of it. Can NASA continue to justify operations that use a marching army when the private sector can do it with a sprinting platoon?" By Keith Cowing on July 9, 2011 10:26 AM. "The proposal released on July 6 by the House Appropriations Subcommittee for Commerce, Justice, Science and Related Agencies to terminate the James Webb Space Telescope would waste more taxpayer dollars than it saves while simultaneously undercutting the critical effort to utilize American engineering and ingenuity to expand human knowledge. Such a proposal threatens American leadership in the fields of astrophysics and advanced space technology while likely eliminating hundreds, if not thousands, of high-tech jobs. Additionally, this proposal comes before the completion of a revised construction plan and budget for a launch of JWST by 2018. The United States position as the leader in astronomy, space science, and spaceflight is directly threatened by this proposal." By Keith Cowing on July 8, 2011 1:10 PM. 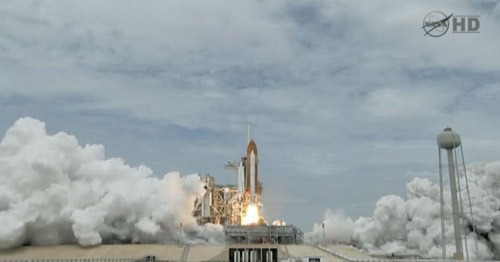 "After a heart-stopping pause at T-31 seconds, Space Shuttle Atlantis left Earth and leapt above the sky this morning. This is the last time a space shuttle will ever do this - and everyone in attendance at the launch site knew it. Up until a short time before launch gloomy weather forecasts had left a sense of doubt among all who gathered here at NASA's Kennedy Space Center. Half an hour or so before the scheduled launch time the weather suddenly started to improve - and with it, the crowd's expectations. I am not going to write about all the geeky stuff. Everyone else is doing that." By Marc Boucher on July 8, 2011 11:19 AM. With a 70% chance of a weather violation the Space Shuttle Atlantis beat the odds and thrilled close to a million gathered people who waited hours to see the final launch of a Space Shuttle. Main engine cut-off and external tank separation have just occurred. Update: Watch the final launch again on the next page. Continue reading Final Launch Successful - Flight Shuttle Flight Underway. By Keith Cowing on July 7, 2011 4:49 PM. "Now, as we celebrate the accomplishments of the space shuttle, we look forward to blazing that new trail, one which will finally bring us closer to achieving the real dreams and true promise of the space shuttles: inexpensive, reliable, safe human spaceflight. This transformation won't take place overnight. NASA, Congress and others still have the power to get in the way and create a self-fulfilling prophecy by preventing it from happening, at least in this country. We will only lose America's leadership in human spaceflight if we prevent the free market from pursuing multiple, independent launchers and vehicles." By Keith Cowing on July 7, 2011 1:16 PM. "The umbrella space act agreement is Kennedy's latest step in its transition from a historically government-only launch complex to a multi-user spaceport. Sierra Nevada also has space act agreements with NASA's Johnson Space Center in Houston; NASA's Langley Research Center in Hampton, Va.; NASA's Dryden Flight Research Center at Edwards, Calif.; and NASA's Ames Research Center in Moffett Field, Calif."
By Keith Cowing on July 7, 2011 11:01 AM. "As things stand right now weather is the only thing standing in the way of an otherwise flawless countdown for the last Space Shuttle mission. No technical issues are being tracked except for some air conditioner problems in a building in Houston. In other words, this has been "textbook" thus far from the hardware point of view." 7 July update: As torrential showers descend upon Kennedy Space Center, concerns linger as to whether conditions tomorrow at this time will permit a launch to occur. As has been the case in the past bad weather can suddenly yield a favorable window. At this time NASA seems to be intent upon going ahead with the countdown in case this opportunity arises. If weather forces a scrub odds are that there will be 48 hour delay with an attempt on Sunday. A GPS launch currently has the range reserved between 11-5 July and NASA is looking at ways to possibly get 11 July from them. Two Views: Where Have We Been - Where Are We Going? By Keith Cowing on July 7, 2011 10:59 AM. "The conventional wisdom in the federal bureaucracy is that you can reduce spending or you can restructure, reprioritize and reorganize. You can cut programs or start new programs. But you can't do both. Now, our backs are to the wall. To re-establish our leadership in space, we must defy conventional wisdom and cut spending, start new initiatives and radically restructure a mature agency - all at the same time. It won't be pleasant, and it won't be easy, but neither was putting a man on the moon." "One misimpression is that the U.S. human spaceflight program is stalled. The truth is quite the opposite. Soon after President Barack Obama took office, an independent commission concluded that the National Aeronautics and Space Administration's then-existing plan for the post-Shuttle era was not viable under any feasible budget scenario." By Marc Boucher on July 6, 2011 6:21 PM. - $3.65 billion for Space Exploration which is $152 million below last year. This includes funding above the request for NASA to meet Congressionally mandated program deadlines for the newly authorized crew vehicle and launch system. - $4.1 billion for Space Operations which is $1.4 billion below last year's level. The legislation will continue the closeout of the Space Shuttle program for a savings of $1 billion. - $4.5 billion for NASA Science programs, which is $431 million below last year's level. The bill also terminates funding for the James Webb Space Telescope, which is billions of dollars over budget and plagued by poor management." By Marc Boucher on July 6, 2011 6:20 PM. "Question: So a slight deviation from the economy -- we have a lot of questions, and this will be our last before we start reading some responses to your question -- about the space program. And this one from Ron: "Now that the space shuttle is gone, where does America stand in space exploration?" THE PRESIDENT: We are still a leader in space exploration. But, frankly, I have been pushing NASA to revamp its vision. The shuttle did some extraordinary work in low-orbit experiments, the International Space Station, moving cargo. It was an extraordinary accomplishment and we're very proud of the work that it did. But now what we need is that next technological breakthrough. We're still using the same models for space travel that we used with the Apollo program 30, 40 years ago. And so what we've said is, rather than keep on doing the same thing, let's invest in basic research around new technologies that can get us places faster, allow human space flight to last longer." Continue reading POTUS NASA Remarks in Twitter Town Hall. By Keith Cowing on July 6, 2011 1:40 PM. Keith's note: According to a tweet by Brian Berger at Space News: "House CJS mark also "terminates funding for [JWST] , which is billions of dollars over budget and plagued by poor management". By Keith Cowing on July 5, 2011 9:25 PM. "Bittersweet is the exact right word," said Titusville Mayor Jim Tulley, who retired from a career with shuttle contractors Lockheed and United Space Alliance. "For the people being laid off, it's a little more bitter than sweet. We're going to look back at this program with just an incredible sense of pride." But first, it's time to party, with celebrations starting Wednesday evening in downtown Titusville, and running through the day and all night Thursday, right up to Friday's 11:26 a.m. launch." "The loss of space technology jobs means the loss of very high paid jobs" Fishkind told WMFE, "so it has larger than normal consequences for the area's economy." He said the loss of so many high wage jobs is having a larger multiplier or "ripple" effect across the entire economic landscape. Still, he thinks Brevard County is better prepared now than it was when the Apollo program shut down in the early 1970s. "Today NASA is down to 5,500 contractor employees and 1,200 civil servants working on the shuttle, said program manager John Shannon. That's a total of 6,700 people who process the shuttle and support it during flight. If the shuttle launches July 8, as expected, another big layoff will come on July 22. At that time NASA will lay off about 3,200 contractors, Shannon said." By Keith Cowing on July 5, 2011 7:13 PM. 1. The Department must preserve the scientific, engineering and design skills and production capabilities necessary to support both large- and small-SRMs. The DoD cannot allow the SRM industrial base to shut down until DoD determines its next generation requirements because the potential expense and schedule delays of restarting the industry would be too great. The SRM production capabilities are needed to support the MM III through 2030 and the D5 through 2042. ..."
By Keith Cowing on July 5, 2011 2:04 PM. "The space shuttle was sold to America as cheap, safe and reliable. It was none of those. It cost $196 billion over 40 years, ended the lives of 14 astronauts and managed to make less than half the flights promised. Yet despite all that, there were some big achievements that weren't promised: major scientific advances, stunning photos of the cosmos, a high-flying vehicle of diplomacy that helped bring Cold War enemies closer, and something to brag about." By Keith Cowing on July 5, 2011 12:37 PM. "Our community is going to lose the gift of hundreds of thousands of hotel rooms that we didn't really have to work very hard to fill," said Thompson. With the last launch, the town's identity will slip a little further into the past. "For me, it's probably going to be a lot of joy and a lot of sorrow all at the same time," said Socks, who knows when the tourists depart this time, all that will be left is a suddenly, shockingly empty sky. "The agency's vaunted astronaut corps, trained to withstand high acceleration, dangerous spacewalks, isolation and countless technical hiccups, now confronts a challenge with no handy checklist: the unknown." "As the clock ticks down to this week's final space shuttle launch, there is a mounting sense of uncertainty about future U.S. dominance in space." "For the past 30 years, NASA's space shuttles have served as the primary vehicles for our collective out-of-this-world imagination. Though only venturing into low-Earth orbit -- a mere 250 miles to the International Space Station, not much farther than a drive from the Bay Area to Pismo Beach -- shuttles kept a solid American foot in the doorway to more. But somewhere along the way "astronaut" became just another career. And shuttle expeditions became so routine, the general public often didn't know when a craft was in orbit or not." "NASA's critics say the human spaceflight program is in a shambles. They see arm-waving and paperwork rather than a carefully defined mission going forward. NASA has lots of plans, but it has no new rocket ready to launch, no specific destination selected, and no means in the near term to get American astronauts into space other than by buying a seat on one of Russia's aging Soyuz spacecraft." By Keith Cowing on July 4, 2011 9:40 PM. The Last Space Shuttle Crew jeted into the Kennedy Space Center on Independence Day, 2011. From Left: Shuttle Commander Chris Ferguson, Pilot Doug Hurley and Mission Specialists Sandy Magnus and Rex Walheim. By Keith Cowing on July 4, 2011 9:34 AM. 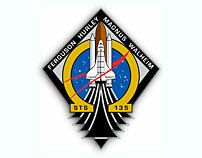 "To maintain this vital life safety margin for long-term ISS operations we are requesting the following: ... To avoid any gap in providing independent repair spacewalks as a safety contingency for the space station, Congress, NASA and the ISS partners should evaluate the option of postponing the launch of STS - 135 until more external fuel tanks and other parts can be built to support additional shuttle flights in 2012." "Garver and other administration officials are getting heat from some of the most famous astronauts on the planet, not to mention members of Congress and aerospace industry executives. Neil Armstrong, the first man on the moon, and someone never known to be a rabble-rouser, recently co-wrote with fellow Apollo astronauts Jim Lovell and Gene Cernan an op-ed in USA Today declaring that the space policy of the Obama administration is in "substantial disarray." The astronauts protested the decision to kill the Constellation program, the George W. Bush-era plan for a new lunar mission with new rockets and spacecraft." "Last week, former astronaut John Glenn expressed his unhappiness with the end of the shuttle program. Glenn called it "ridiculous" and says he has objected to the cancellation since President George W. Bush made the announcement back in 2004. "I'm sorry to see things being cut back or diminished in any way, because I think the country needs research and innovation now more than ever before," Glenn said. "Owning and operating lower-orbit transportation is not in the best interest of the nation," Bolden said of the shuttle program." Keith's note: The timing of this letter and editorial effort by these folks is odd to say the least. The authors wait until the last possible moment and then expect the White House, NASA, and Congress to suddenly do a 180 degree course change in policy - with all of the associated and unbudgeted costs - 6 to 7 years after that policy was announced and agreed to by all parties. By Keith Cowing on July 4, 2011 9:33 AM. "Space experts say the best and brightest often head for the doors when rocket lines get marked for extinction, dampening morale and creating hidden threats. They call it the "Team B" effect. "The good guys see the end coming and leave," said Albert D. Wheelon, a former aerospace executive and Central Intelligence Agency official. "You're left with the B students." NASA acknowledges the effect and its attendant dangers. It has taken hundreds of steps, including retention bonuses for skilled employees, new perks like travel benefits and more safety drills. Through cuts and attrition in recent years, the shuttle work force has declined to 7,000 workers from about 17,000." "By continuing to take on grand challenges in human spaceflight and science, NASA will catalyze America's innovation engine and play a significant role in America's economic recovery. By taking humans to places never before visited, by developing technologies that will serve society in broad ways, some that we cannot yet anticipate, and by empowering us to understand our world, our solar system, and our place in the universe, NASA will continue to serve our nation well into the future. The future is waiting; it's time to claim it." By Keith Cowing on July 2, 2011 3:32 PM. "It was both relentlessly breathtaking and surreal to find oneself at a historic crossroads - looking skywards from directly beneath the wings of the very last shuttle orbiter that will soon be orbiting Earth some two hundred miles overhead. NASA's Space Shuttle's are the most complex and magnificent machine built by humans, constructed with over two and a half million moving parts." By Keith Cowing on July 2, 2011 12:54 PM. "The Economist magazine thinks the Space Age is probably over, and the discussion of our space future (or non-future) in its new issue is intelligent and informative. I've found over the years, though, that in many instances, the Economist's suave articulation of the not-so-cutting edge of conventional wisdom proves wrong. Mark Albrecht hopes that's so in this case, because he's a believer in space exploration, and his new book argues for U.S. leadership in that endeavor." By Keith Cowing on July 1, 2011 2:46 PM. "I am writing to encourage NASA to initiate a competitive bidding process for the propulsion component of the new Space Launch System (SLS). I believe the greatest challenge we face as a nation is the need to balance our spending priorities with principles of fiscal discipline. Rather than consider a non-competitive sole-source contract, NASA should undertake a competitive bidding process to ensure billions of taxpayer dollars are spent in the most cost-effective and responsible manner possible. Furthermore, increased competition will encourage new, innovative technologies that can lead to lower costs and higher value for Americans in the long run." Keith's note: Some staffer needs to get the name of the agency, address, etc. correct next time. These letters are all the same and are addressed to "National Aeronautics and Space Agency" at "200 E Street, SW, Room 9F44". By Keith Cowing on July 1, 2011 2:00 PM. Keith's 1 July update: According to NASA SMD: this is what SMD paid for the reception: "Planetary Program costs: $37.5K, which included the NASM facility rental, rental for chairs/stage/tables/etc, a/v, music, lighting and rigging, delivery, taxes." That's $37,500 that could have been spent on science. Instead, Ed Weiler spends it on a party. Keith's 30 June update: According to the AAS: "AAS handled the reception, the costs of which were covered by the corporate sponsors. Over 250 people attended, and the cost per person for food was approximately $48." AAS did not handle rental for the facility, travel costs, media or any of the other things associated with this event. Rental of the floor space alone is in the range of $25,000 - even when discounted for NASA by NASM. NASA clearly wrote some large checks - and the money came from SMD - and that is money that was not available to be spent on actual EPO - or science. Yet last night at the reception SMD people were telling attendees (in response to my Twitter posts) that "no SMD money was used". I am waiting for SMD to tell me what the cost to NASA was. Stay tuned. Continue reading NASA SMD's Fancy Dinner Party (Updated). By Keith Cowing on July 1, 2011 11:53 AM. "In just a couple of hours, I am delivering an address at the National Press Club to talk about NASA's future, and before I do so, I wanted to share with you what I'm going to be discussing. You can also watch the speech at 1:00 P.M. EDT on NASA TV or the Web, or if you are at Headquarters, in the James Webb Auditorium. ... Some say that our final shuttle mission will mark the end of America's 50 years of dominance in human spaceflight. As a former astronaut and the current NASA Administrator, I want to tell you that American leadership in space will continue for at least the next half-century because we have laid the foundation for success - and here at NASA failure is not an option." By Keith Cowing on July 1, 2011 9:09 AM. "We, the families of the Space Shuttle Challenger crew and founders of the Challenger Center for Space Science Education--heroes we lost to further the exploration of space--strongly support the continuation of human spaceflight under a new paradigm of commercially led efforts to low earth orbit, and government led efforts beyond. We recognize that commercial development in human spaceflight is a new paradigm, but so was America's government-driven space program at its birth more than 50 years ago. Our nation and others have been quite successful in moving the aviation industry from a military and government led operation to a viable commercial industry; we believe a similar approach is now necessary in space. We also recognize that the commercialization of space will bring new innovations, capabilities, public interest, and economies to the grandest of human endeavor. This will also allow NASA to focus on deep space exploration, as it should."